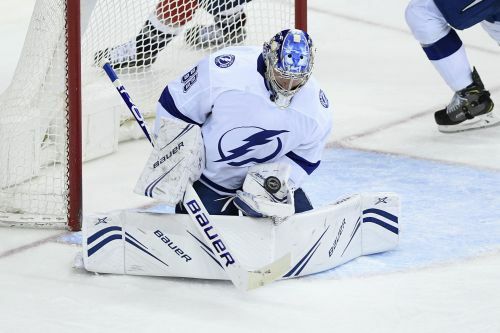 WASHINGTON (AP) — Andrei Vasilevskiy made a franchise-record 54 saves, Nikita Kucherov scored twice and the NHL-leading Tampa Bay Lightning won their sixth consecutive game, beating the Washington Capitals 5-4 in overtime Wednesday night in a potential playoff preview. Victor Hedman scored 3:01 into overtime to keep the Lightning rolling in their first game since clinching the Presidents' Trophy and home-ice advantage throughout the playoffs. Vasilevskiy was on top of his game as Washington set a franchise record with 58 shots. He rebounded in the overtime after allowing Evgeny Kuznetsov to tie the score with 52.6 seconds left in regulation. Kucherov's goals came on the power play and gave him 37 overall this season and increased his league-leading point total to 119. Anthony Cirelli and Steven Stamkos also scored for the Lightning. Stamkos added two assists. The Lightning's league-leading power play went 3 for 3, and their penalty kill was 5 for 6, thanks in large part to Vasilevskiy. Lars Eller, Carl Hagelin and T.J. Oshie scored for the Capitals, who are trying to hold on to first place in the Metropolitan Division. Braden Holtby allowed five goals on 28 shots as the Lightning beat the Capitals for the second time in five days. ANAHEIM, Calif. (AP) — Connor Hellebuyck made 29 saves in his first shutout of the season, and Kyle Connor had a goal and an assist in Winnipeg'S fourth straight victory. Mark Scheifele scored a power-play goal in the first period and Nikolaj Ehlers added a goal for the Jets, who extended their lead atop the Central Division to three points over Nashville. Jacob Trouba had two assists as the Jets completed a Southern California sweep and moved into position to clinch a playoff berth as early as Thursday in Vegas. John Gibson stopped 20 shots for the Ducks, who were shut out for the seventh time in 2019. Anaheim had won six of nine in a late-season surge before getting shut down by Hellebuyck. BUFFALO, N.Y. (AP) — John Tavares and Auston Matthews each had a goal and assist, and Toronto won for just the second time in six games in beating Buffalo. Mitchell Marner and Zach Hyman also scored and the Maple Leafs inched to within four points of the idle Boston Bruins in the race for second place in the Atlantic Division standings. Garret Sparks stopped 22 shots for Toronto, which was playing on consecutive nights after a 3-0 loss at Nashville. Casey Mittelstadt and Alexander Nylander scored for Buffalo, which dropped to 1-7-1 in its past nine. VANCOUVER, British Columbia (AP) — Bo Horvat had two goals and an assist and Vancouver kept its playoff hopes alive with a win over short-handed Ottawa. Tanner Pearson also had two goals for Vancouver (32-32-10). Brock Boeser, Jake Virtanen and Loui Eriksson also scored. The Canucks matched their longest winning streak of the season with their third straight victory. Elias Pettersson had two assists. He leads all rookies with 27 goals, 36 assists and 63 points. Canuck goaltender Jacob Markstrom stopped 21 shots. Ottawa made it interesting when Max Veronneau, Brady Tkachuk and Oscar Lindberg scored goals 4:48 apart in the third period. Anthony DuClair scored on the power play with under two minutes left with goaltender Craig Anderson on the bench. Anderson made 33 saves for Ottawa.